How come the Ring is in trouble? Is it serious? By now you have heard the Ring / Nürburgring / Nordschleife is in trouble, otherwise you probably wouldn’t be here reading. I can offer you my personal position on where we are and I hope it helps you to understand the current situation. To do this you need to know who I am, as much of the information flying around is biased. I’m sure mine is too, therefore I lay out my Ring-related background. I admit it looks like showing off, still I feel you need to know where I’m coming from. Riding my bikes, preferably GSX-R. Countless Jahreskarten as well as some stationary periods in Adenau hospital. More serious endurance racing later too. I never raced cars though. Supporting MTM Audi 200, which is owned by two mates and put on the 24 Hours starting grid over 10 times since 1994. Watch Chris here on youtube lapping Nordschleife in 7:40 mins. Taking part in 24 hours bicycle race on Nordschleife. We joined with our team of 4 since day one in 2003, but said good bye last year. Ridicolous prices and equally redicolous NAG involvment. Gixxerkart, Achim deserves all the credit, all I donated was the idea and the engine. The toy still exists btw. renn.tv - prior to youtube I put in a lot of effort to conserve some of the best machinery in action of that era, glad I did. 20832.com aka nurburgring.de, Nürburgring site, which is online since year 2000. It originated around the Audi 200 project. Red-and-White N, you might have seen this. Even though this sticker has never been for sale and still isn’t. It’s my registered brand since many years, just to protect it. Save The Ring, not something I love to do, but had to do. My initial Jalopnik guest entry kicked it off late 2010. On Facebook and Twitter too. I’m also one the persons who has been sued by Kai Richter (the N-Forum trial). Extensively documented here and we’re still not fully done with it. My bill is over 10.000 Euros, however donations came in quickly and I’m fully covered. I did offer some multimedia services for money in the past within the motorsport area, but I’m out of that since youtube took over. I work as an IT guy in the automotive industry since 20 years now, still I keep 20832.com running in parallel. The reason I tell you all this background: many people communicating on the Nürburgring subject are commercially involved in one way or another. Thus they try to favour a certain opinion. I want you to judge yourself, all I can offer is to be honest and open. I have nothing to lose, but I do value the Nordschleife a lot - both it’s history as well as the present track. I summarized the last 5 years from my point of view here in a German post I did yesterday and in case you understand German I invite you to read this. Today the news of a bust Nürburgring kept spiraling, but some news contained errors while others only looked at a fraction of the problem. I by no means am completely in the known, but certain things spring to my eyes and I can only offer you to give you my perspective - maybe a petrol head like you. I do this a bit differently to the German post, as I’ve learned from the comments that internationally the spread of knowledge (little vs a lot) is even wider as it is over here. I’m sharing with you what I think what happened. So what is this bad news of the Ring all about? From 2007 to 2009 the Ring has been expanded by a leisure park including hotels, roller coaster, restaurants, ring werk, etc. It was projected at 215 Mio Euro, but ended up in the area of 400 Mio Euro. They opened the complex at the F1 in 2009 - exactly 3 years ago. The project has been promoted in the public with significant contribution of private investors, but they never materialised. Only one investor - Kai Richter - was left and only later it turned out that over 85 Mio Euro in public money have been transferred into his accounts, as he claimed his bank pulled out at the early stages of the project. The government (Rhineland-Palatinate “RLP”, they own the Ring 90%, the remaining 10% is with the county Ahrweiler) bought everything, which has been built - from hotels to club to restaurants. Most of the money came from public funds anyways. They also took over all debts. For the first time of the Ring’s long history starting in 1927 the complex has been rented out to privateers. Funny enough to the same Kai Richter, who once was introduced as investor - together with Jörg Lindner, who was part of the initial private engagement too. The contract has been put in place for 30 years, but the operators are not paying the rent the government expects, which is why their contract got terminated in February this year. The debt is with the public company “Nürburgring GmbH”, while the two private operators called their company “Nürburgring Automotive GmbH”. What does EU Brussels have to do with that? EU has investigated in depth, mainly due to legal action by “Ja zum Nürburgring” and Dorint Hotel. They came to the conclusion that the RLP Government supported the leisure park, but also the rest of the Nürburgring, with illegal state aids. Their preliminary total sums up to 524 Mio Euro, you can read the full report in English here. RLP wanted to inject another 13 Mio Euro to keep the public company “Nürburgring GmbH” alive, which seems to be illegal within the contract of the European Union. The Ring does not receive enough money from the private operators to pay the intersts and RLP is not allowed to put more money in. Thus the risk of being insolvent soon. Will the Ring close when it goes bankrupt? Probably not, because the Ring earns money only when kept open. But it might be under control of the insolvency administrator or a private owner thereafter. Will there be the 24 Hours race next year? Time is running out, as FIA/DMSB have deadlines in July. ADAC president Peter Meyer has published an open letter addressed to Kurt Beck (Premier of RLP) complaining about the situation. Since then nothing seems to have happened. ADAC does not see any point in signing a contract with NAG. So bottom line: we don’t know. Why didn’t you tell us earlier? I did. In fact I’m telling you way before the first construction work started. I’m trying to raise awareness for the desaster since the first plans have seen the light of the public. The problem is to get heard in all that buzz going on. Lindner and Richter are the problem - right? Only partially. They are running the Ring now and everything you see - homepage, Facebook, bills, newsletters, etc., … - comes from them and their company. Things like this too (read here for more info). But an even bigger problem are the politicians at the RLP government, who made this all happen. Why does the government not help? They are not allowed to and even worse, they are part of the problem. I don’t know why, but they make every possible effort to not allow outside people gaining insights into contracts and agreements. It seems they fear something, but I can’t figure out what. Prosecution in the RLP county is no help either. Can’t we crowd-fund and buy the Ring? Right now the Ring isn’t even for sale yet. On the other side the Ring has always been in public ownership - owned by everybody of us. “Ja zu Nürburgring” feels it’s essential to keep the tracks that way in order to support (gras root) motorsport. I agree with their views. What would be your solution? Two things need to happen urgently: seperate the tracks from desastrous NuroDisney and get rid of the private operators. The rest can be sold or otherwise taken care of, but the tracks need to be run by a public company in benefit to the public. Run by management not looking after themselves, but looking after a solid future for the Ring. Who is it actually in person to blame that huge desaster? It’s too many to list, but Kurt Beck (the RLP premier) is the main figure in that plot. Local and county politicians come next along with all these greedy suits. Please spread the word. Even though it might sound too little, if we keep growing as an international supporters group, we will always be there when needed. Like now. Put a sticker on your car and ask for friends for the same. You can make one yourself with the artwork via download on savethering.org - or pick one up at Hotel Tiergarten in Nürburg. You might even race your GT3 in STR livery. Or anything else you have in mind, great things keep hitting the Facebook page. How big is the problem in Euros? Debt of the public “Nürburgring GmbH” is currently 413 Mio Euro. (It was 27 Mio Euro in 2006). Illegal state aid claimed by European Commission is 524 Mio Euro at this point in time, might even grow. They keep telling they had to do something at the Ring - is that true? In my opinion: no - not at all. Ring was fine, it was just suffering horrible management and crazy amounts of money wasted. All this was known and criticised by governmental audit year after year - with no consequences. Aren’t you competelely fed up with all these years of hopeless fighting? Yes, I am. Still I want to look into the mirror saying to myself I tried everything I could to protect Nordschleife for future generations. Let the Ring go bust and sell it off, it can only change to the better. The Ring has been in public ownership since day 1 (which dates back to 1927). It would be a tragic loss to the community if it would get sold. If the EU can help banks and even countries, why can’t they help the Ring? EU has never been asked for money in the first place. The Ring has been put into that situation by greed and megalomania. If you have read thus far, thank you for that. We are pretty balanced on the facts now. If there is anything else you want me to ask, I’m happy to hear that and would update the post accordingly. Now it’s official - today July 18th 2012 - the Rhineland-Palatinate government under premier Kurt Beck called a press conference at 10:30 am. They declared they will file for bankruptcy for Nürburgring GmbH. This is making big news in all German media and the motorsport media worldwide. Hard to believe, but Kurt Beck refuses to resign and blames EU, who made that step neccessary in his view. Liquidators have been anncounced and the first thing they did was a press conference. At the Lindner Hotel. Jörg Lindner (NAG, operator with terminated contract since Feb.) stated in a TV interview he would consider buying the track. Now get this: the Ring is bankrupt because of missing rent and the lessee is allowed to consider to buy it. Even Mr.E has been quoted buying the track, rumours are spiralling. In my view this discussion on who would be a suitable buyer does distract from the fact that we are talking public ownership here. If the Ring falls into private hands - no matter who - would mean worst case szenario, as the owners could do with Nordschleife whatever they want. From day 1 onwards since 1927 the Ring is in public hands and had to serve region and motosport alike. Only recently (2010) abuse started to line privateers pockets. First thing the liquidators stated was to find an agreement with NAG to leave in order to secure the 2013 season. NAG hasn’t left for the last five months and time running by does them a favour. Which they know. I wouldn’t expect them leaving anytime soon. At the same time this was the first press release of Nürburgring GmbH since years. They stepped back from communicating when NAG took over in May 2010. Still NAG keeps control over the Ring’s Facebook account and stuff. Critics against the Rhineland-Palatinate government - and especially Kurt Beck - become louder, as internal papers slowly leak into public. One says the government was fully aware of acting against European Law when they supported construction of the hotels, restaurants etc. with public money. 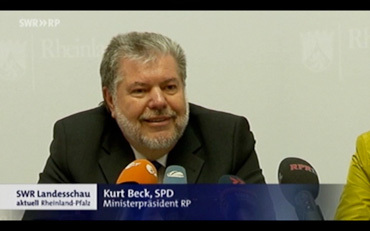 Kurt Beck - the RLP socialists premier - is in charge since 1994 (!) and won’t be the leader for the next election - which is due in spring 2016. His problem is now to prepare for a nice retirement, but on the other hand he doesn’t seem to dare to give up powers. The public hasn’t seen yet what he needs to hide, but my impression is that it must be huge. At least big enough of a problem to destroy his nice retirement plans. Chances that Kurt Beck resigns are rather low, even though the damage under his leadership is significant. If he does resign it would open the possibility of proper investigations, which currently seem to be fully blocked. It’s fair to say that the future of Nordschleife is inversely proportional to Kurt Beck’s political career. The Nürburgring - from prestige project to catastrophe. On Wednesday August 1st the Rhineland-Palatinate Parliament came together for an extraordinary meeting. They scheduled that to discuss the Nürburgring insolvency and consequences for the county. The debate has made it to all relevant German news, I’ve compiled a list here. Prior to the heated session the government realeased funds of 254 Mio Euro in favour of the state owned bank ISB, as the state has given the guarantee for the 330 Mio Euro Leisure Park debt of Nürburgring GmbH. As they are insolvent the bank with only around 240 Mio Euro own capital came under risk too and called for the state money. Several international news gave the impression that this money supports the Ring, but in fact only the debitor changed. The amount of debts remains unchanged. Jörg Lindner is quoted too - he and Kai Richter are still running the Ring with their NAG company, even though their contract got terminated by government in February 2012. I have no idea why the government does not force them out and I suspect some arrangements we do not know. Prior to the meeting this made some news, as several experts regard both the credit and now the state’s guarantee as illegal state aid under European legislation.